Your child can watch, interact and play along with the Eggsperts and their friends in this interactive appisode. Featuring stunning 3D animated episodes along with interactive educational games, the Eggsperts series is a wonderful new way to inspire language play. Join the Eggsperts - Sam, Jazz and Tom - as they travel from their village of Eggleston on a fun filled adventure to one of 4 amazing lands on their quest to find clues, hatch eggs and meet new friends. 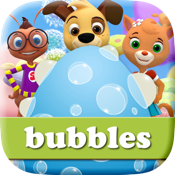 - Bubbles full length 3D high end animated episode. - Three fun interactive educational games that build knowledge of letters and sounds. - Karaoke sing-along to the Eggsperts Bubbles song. - Sneak peak preview of the next exciting Eggpserts appisode adventure. - Voice accent options for AU, UK and US. - Suitable for children aged 4 – 7 years. - Inspires language play with a focus on phonemic awareness. - Children listen for beginning sounds, rhyming words and have tongue twisting fun following these energetic characters in the upbeat, energetic 3D animation. The Eggpserts Bubbles appisode is brought to you by Blake eLearning in association with Flying Bark Productions. Blake eLearning are the makers of the popular education website Reading Eggs – a team of educators with more than 20 years’ experience in early childhood education, who believe learning to read should be fun, motivational, and full of success.